Born in 1947, Pierre Delorme practiced martial arts since he was 15. In English boxing, he became national champion three times, and twice international. He also practiced French boxing and stickfighting (Canne) for many years. As an architecture student, he became interested in Japanese architecture and discovered Japanese martial arts. 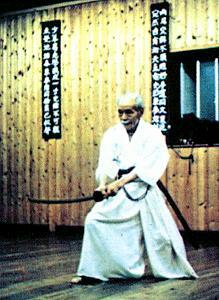 After starting in Aikido, he picked up Kendo in 1969. During an 18 month scholarship to study quake-resistant buildings in Tokyo, he studied Kendo and Muso Shinden ryu under Okada Morihiro and his son Okada Yasuhiko. He now teaches in Paris and works as cartoonist and comic artist. Pierre Delorme has authored several volumes of great importance on this experience. His first book "Dojo, le Temple du Sabre" (Editions Solar, 1979, 247 pages) is the story, full of anecdotes and bits of wisdom, of his stay in Japan and the daily training under the great master Okada. I have read no other book that equally succeeds in taking the reader to the heart of traditional training in Japan and its profound influence on the participants. In complete honesty, Delorme even shares his occasional fantasies involving a sudden demise of the terribly severe waka sensei Okada Yasuhiko. This book certainly rivals Dave Lowry's "Autumn Lightning" and "Persimmon Wind." Lowry's experience is very personal, where Delorme writes more from the perspective of a member of the dojo. An important feature of this and other books by Delorme are his often humorous drawings. "Kendo, la Voie du Sabre" (Letrres du Monde, 1980, 174 pages) was verified by Okada Morihiro. Unlike most Kendo books, this one insists on fundamentals and important points of reference to assist in practice, and their profound reasons instead of just techniques. As a result, this book is valuable for all martial artists, not just for Kendoka. The author believes most Kendo books to be superficial or anecdotical, not because the Japanese are incapable of writing a good book, but their conviction that "practice and knowledge are one" prevents them. The author's opinion differs for two reasons: during his stay in Japan, he saw that besides the great masters and champions, there was also a great number of very poor budoka, completely lost to the way. In the west, the number of practitioners is too small to allow such wasted potential without trying our best to enlighten them. The second reason for writing the book is that Okada Morihiro and Okada Yasuhiko were unlike many Japanese teachers that give superficial advise and flattery to the gaijin, they always explained everything in great detail. Techniques are only mentioned to help explain the importance of these basic points. The author offers advice on training and on mistakes to avoid, and many hints on maintaining correct posture, respiration and spirit. Most of the advice is quoted from Okada sensei's instruction. 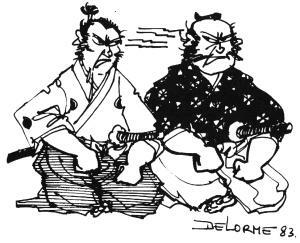 Delorme frequently refers to Iaido, because "Kendo is not fencing with bamboo sticks, and to understand the real sword, Iai practice is needed." The book includes a short Kendo history. "Iaido, le tranchant du sabre" (Editions de la Maisnie, 1981, 142 pages) and "Iaido II, le chemin du sabre" (Editions de la Maisnie, 1984, 91 pages) are probably the first publication in the West about Iaido (together with "Japanese Swordsmanship" by Warner and Draeger, also from 1981). 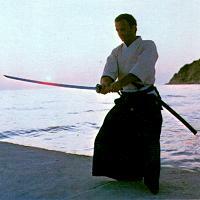 It is of course very tempting to compare "Iaido" with "Japanese Swordsmanship." 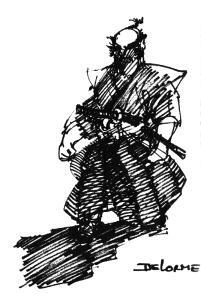 The latter is obviously a higher budget production, with numerous photographs instead of the line drawings in "Iaido." It also contains a more thorough history section. 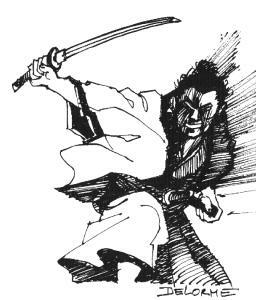 However, as it deals with seitei Iai, the technical part of "Japanese Swordsmanship" is hopelessly obsolete, whereas the information on Muso Shinden Ryu in "Iaido" is still as valid as ever. 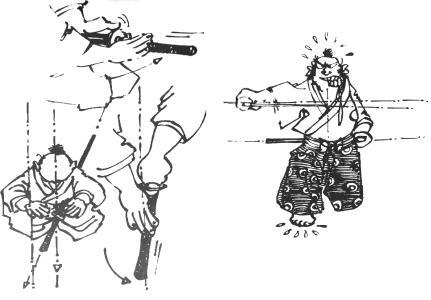 More than half of "Iaido, le tranchant du sabre" is a detailed explanation of basic movements (nuki tsuke, seme, furikabute, kiri tsuke, chiburi, noto tsuke) and principles (zanshin, respiration, timing, anatomy). The rest of the book gives advice on each kata in the Omori Ryu set, and a relatively short description of the seitei gata (as obsolete as the one by Warner and Draeger), interestingly, it includes the anatomical targets. There are a few photos of Okada sensei and the author. The last pages of the book include an announcment of "Iaido II," to contain the 10 Chuden and 19 Okuden forms of Muso Shinden Ryu. It even has a preview of Itomagoi. I don't know what unfortunate twist of fate interfered, but "Iaido II, le chemin du sabre" contains only the Chuden set and some meaningless filler. If this book had been published as announced, it would have made the "Iaido" series one of the only (perhaps the only) non-Japanese description of the complete Muso Shinden Ryu Iaido sets.